Snow Canyon called to me. I could not wait to finish my law classes in nearby St. George and head into the canyon for an evening hike. I chose the Hidden Pinyon Trail, a popular trail over and through twisting redrock slots and boulders, past blooming prickly pear cactus, Mormon tea plants, black brush, and flowering yucca. I felt lonely and disconnected in my relationships, wondering who I was and questioning about god and life. Arriving at a ridge line 300 above the canyon floor, I sat cross-legged on a patina-stained ledge, raised my staff with both arms to heaven, and called upon the universe for answers. This poem attempts to convey the experience that followed. 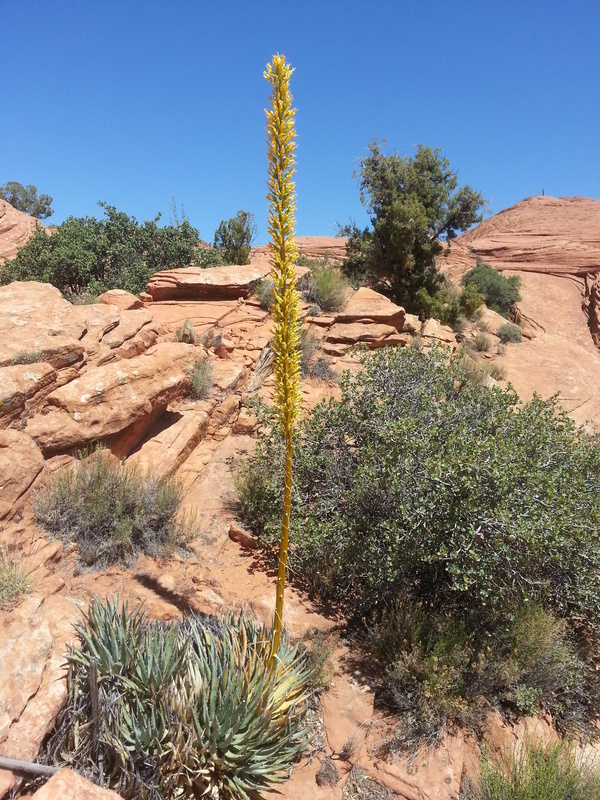 The photograph above is a Utah Agave plant with its bloom growing seven feet tall in Snow Canyon. in the lichens’ greens and grays. in the lonely quail call. by grinding wind and splintering ice. as you cause the fine red sand to sift through wondering fingers. This entry was posted in Enlightenment, Memoir, Nature, Poetry and tagged Hidden Pinyon Trail, Hiking, Poem, Prayer, Redrock, Snow Canyon, Utah agave on January 18, 2015 by Roger Baker-Utah. Tears… connecting on so many levels to this expresson. So very beautiful, as always, Roger. Roger my friend…If there is such a thing as reincarnation, you must have surely been there with me sitting in our lodge smoking the prayer (peace) pipe, boasting of our accomplishments and victory’s.. If not in the former, hopefully in the next!